A smart collaborative platform for streamlining music to picture workflow. For everyone who works with and around “music to picture,” spanning pre-production, production, post, and music clearance & administration, qwireMusic is the cloud collaboration platform that helps us all stay on the same page. With a suite of integrated, user specific modules, qwireMusic maintains individual workspace integrity, while advancing convenience and efficiency. Create in peace and work in harmony. We know that a composer’s job involves far more than writing music. And it begins long before the first note is written. That’s why qwireMusic is with you every step of the way, providing tools that make it easier for you to stay in a creative mindset. Share spotting notes and scoring ideas with team members. Assign and track tasks. Manage budgets and receive expense feedback in real-time as your creative choices evolve. 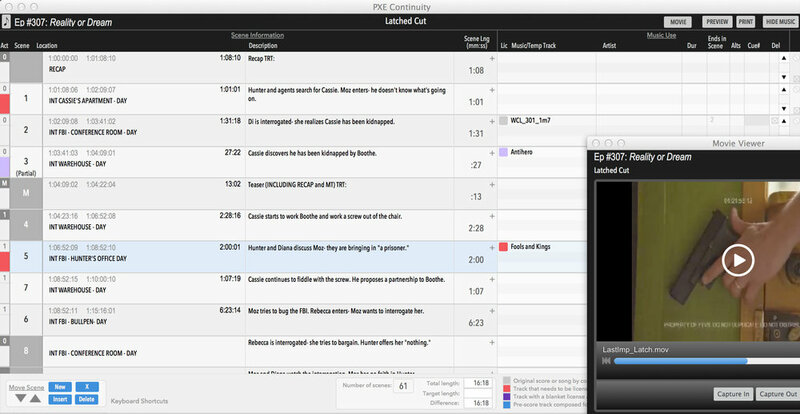 And eliminate cue sheet errors by capturing music rights information while you work. We know that music supervisors and clearance departments are in constant triage mode. Deadlines are getting tighter, cuts aren’t locking, the breadth of music available is exponentially growing, with much of the growth in the “improperly-registered-with-the-PROs” (or not at all registered) sector. The internet is making it easy for directors, editors, producers & executives to hurl music at you from all corners of the world. Did you email the latest list of approved songs to the picture editor? Have you generated last week’s episode’s budget for the studio that they keep asking for (or the one from 2 months ago)? Did you follow up with that rights owner who has 2% on the song that everyone loves, but is holding up the entire project? Fire after fire after fire. qwireMusic gives you a single location to keep everything you’re tracking. A place where you’ll never wonder which information, correspondence, or creative input is current. A place where sharing ideas and music is immediate, simple, clean, and effortless. We know that a music editor’s work depends on good data from everyone in the chain. qwireMusic has what you need before you’ve even thought to ask for it. How great would it be if you didn’t have to conduct an inquisition to collect music rights info — if it just magically and accurately populated the cue sheet as the project was completed? How cool would it be if you could begin your spotting sessions with the notes formatted and largely pre-populated with data from the editor’s continuity? How amazing would it be if you could capture time code ins and outs with a keystroke — without ever having to retrieve and then enter time code manually? We know that picture editors have a tremendous impact on music. First impressions speak loudly in the world of music to picture, and the picture editor is almost always first to the party. It may not be in your job description, but for better or for worse, you are often judged as much on temp music as you are on the cut. And yet, somehow you’ve had to drive the music bus blindfolded. That’s about to end. qwireMusic has arrived with a busload of help for the picture editor. qwireMusic makes it easy for you to share ideas with project collaborators in real-time, automate and streamline updates to the continuity. Its suite of integrated modules allows you to benefit from information that qwireMusic has captured from other users, like licensing status from the music super, or cue descriptors from composers and music editors (enabling efficient temp searches). As qwireMusic captures, crosschecks, and refines data, it simplifies your workflow, eliminating redundancies and errors.